W.E. A.L.L. B.E. Radio: Weds11/16/2011 @ 9pm c/ 10pm e/7pm p*"Triumph Beyond Measure: The Martha Dixon Story"
topic: "Triumph Beyond Measure: The Martha Dixon Story"
"Martha Dixon is wonderful, wise, gifted, and tough-an amazing woman with an awe-inspiring story. This is a book any person of any age will learn from and enjoy. After you read it, you'll find it harder to feel sorry for yourself, easier to get on with your life and go after your dreams and impossible not to be grateful that Martha shared her story with you. She has been a blessing to Hillary and me, and she will be to you." Martha Dixon Fashion Icon Award from Michael Mueller on Vimeo. 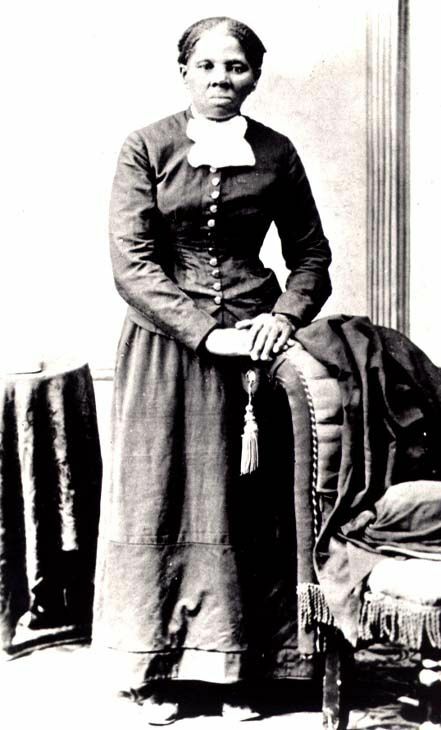 From the backbreaking work of picking cotton in the hot Arkansas sun, the daughter of a poor sharecropper, to the dressmaker for the First Lady of the United States, Martha Dixon's story is uniquely American. Starting with nothing but an entrepreneurial drive, Ms. Dixon rose to the peak of her profession. Triumph Beyond Measure is an impossible story that became possible. A tale of a woman who believed in herself and set her sights high. Inspirational, motivational, and steeped in lessons learned along the way. Triumph Beyond Measure will leave you cheering. "They said you need to crawl before you can walk," writes Ms. Dixon, "but I didn't want to walk. Nor did I want to run. I wanted to fly." Rags to riches. From the poorhouse to the White House. Triumph Beyond Measure is a story everyone should read. 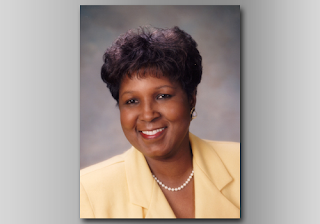 Recognized as one of the "Top 100 Women of Arkansas" by Arkansas Business Magazine, and the recipient of numerous awards for her entrepreneurship, political work, and community service, Martha Dixon rose from abject poverty to the height of her profession. 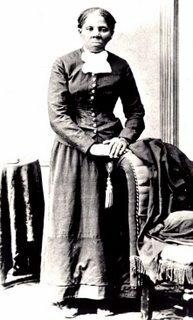 Founder of Dixon Manufacturing, as well as other successful enterprises, Ms. Dixon's meteoric career took her all the way from the cotton fields of Arkansas to the Lincoln Bedroom of the White House and beyond. Dress designer for First Lady Hillary Clinton (her presidential Gala gown remains on display at the Truman Library), Ms. Dixon's stellar reputation and entrepreneurial spirit combined for one of the great success stories of our time. "Know that you are valued by not how much money you make, titles that are bestowed or what you own but rather by how many lives you have touched and enriched with your presence, passions and talents which are priceless on their own…One ♥!" 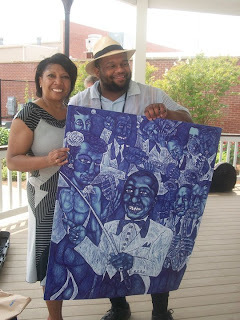 Limited edition prints of this artwork are available for purchase @ $36 ($25 plus $11 shipping and handling)…Part of the proceeds will benefit the John B. Ervin Scholars & the McLeod Scholars programs respectively. 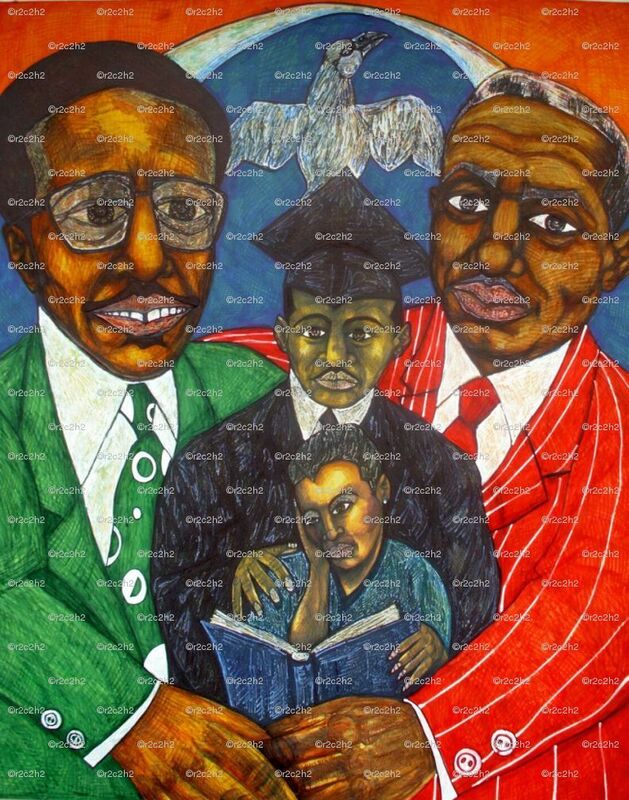 ‘The Legacy’ represents the bond and mission shared by two men of honor, Dean James E. McLeod & Dr. John B. Ervin, in the vision that they had for empowering their people through education. St. Louis has been known as the gateway to greatness and opportunity for those willing to seek it and risk it all in their pursuit of happiness. 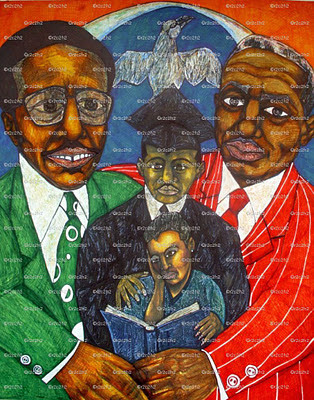 The picture created by R2C2H2 Tha Artivist is meant to embody more the essence than the likeness of these two outstanding individual educational giants…Although both of these men were known as conservative dressers, their dreams and visions to add ‘color’ and ‘flavor’ to Washington University’s campus was anything but. This is represented by their loud or brightly colored suits which also represents the school colors of red, white and green…Paving a trail for others that followed, their collected efforts ensured that people of color will get proper and qualified representation in both academia and other arenas…The arch represents the gateway to opportunity that a real education provides with both Dean McLeod and Dr. John B. Ervin serving as the pillars or gateway keepers. The bird represents both the freedom of expression and the freedom to pursue both your happiness and purpose. The students represent the living legacies of our heroes, thus ‘The Legacy’: The graduating scholar and the student scholar studying…Each one teach one is the key to our educational philosophy and survival and we all should lend a helping hand to help our fellow travelers get to the ‘Promised Land’…Although the Ervin and McLeod Scholars programs are open to anyone who is qualified regardless of race, the Ervin Scholars Program was first started as an initiative to attract more African American scholars to Washington University…However, history has showed when African Americans are granted access and create opportunities for themselves then everyone in society benefits. On November 4, 2011, a framed print of this work of art was presented to Sis. Clara McLeod, the widow of Dean McLeod and one of the early supporters of the art career of Tha Artivist, at the closing reception of ‘Ronald Herd II: The Most Known UnKnown’ art exhibition @ The Nu-Art Series Metropolitan Art Gallery. Limited edition prints of this artwork are available for purchase @ $31 ($25 plus $6 shipping and handling)…Part of the proceeds will benefit the John B. Ervin Scholars & the McLeod Scholars programs respectively. W.E. A.L.L. B.E. 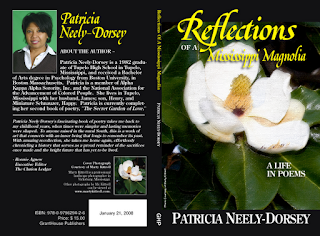 Radio: Weds11/16/2011 @ 9pm c/ 10pm e/7pm p*"Ladies' Night: Women Of The Nu Renaissance"
My book Reflections of a Mississippi Magnolia is a true celebration of the south and things southern. Using childhood memories, personal thoughts and dreams, I attempt to give a positive glimpse into the southern way of life. There are so many negative connotations associated with Mississippi and the south in general. I want to show a flip side of the coin.There is much to love about this much maligned and misunderstood part of our country. I would really love for you to get to KNOW Mississippi (and the south) in a different light and I want to introduce you. 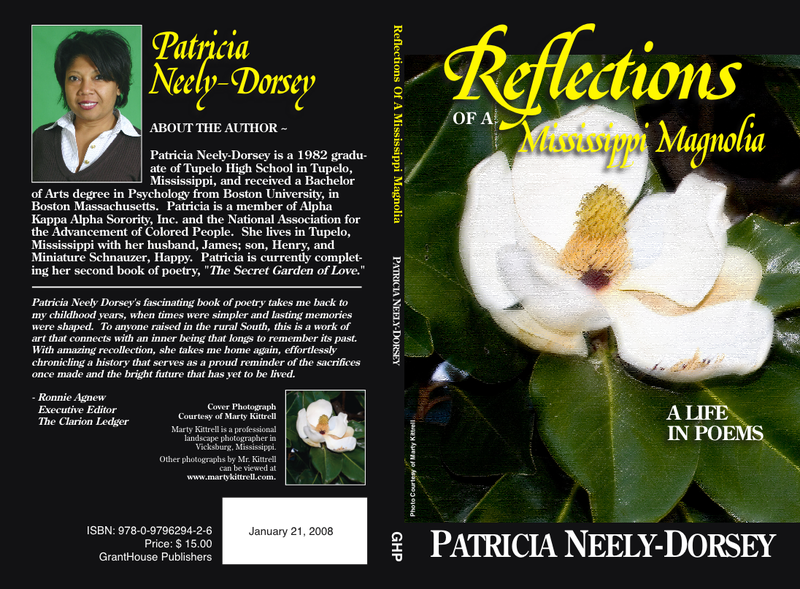 I invite you to Meet Mississippi Through Poetry, Prose and the written word. Thank you for stopping by my site and showing an interest in my "little book of southern poems"
Rest In Soul Power Smokin' Joe!!! Tha Artivist Writes: Smokin' Joe Frazier was Tesla to Muhammad Ali's Edison: A brilliant scientific fighter who never got the due and glory he deserved in life but whose achievements will become venerable in death...A man who was once deemed an Uncle Tom but yet he was one of the few who was conscious and courageous enough to come to the aid of one of his fallen brother comrades (Ali) when The Establishment shunned him and left him out in the cold for several years...Rocky stole his swagger and story and rode it to glory and the bank...May This Champion Forever Rest In Soul Power Using That Formidable Left Hook To Silence His Critics For Eternity...One ♥! 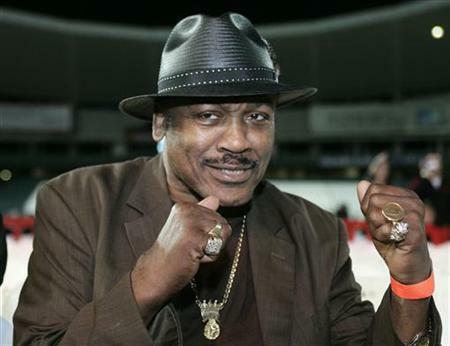 PHILADELPHIA (AP) -- Joe Frazier, the former heavyweight champion who handed Muhammad Ali his first defeat yet had to live forever in his shadow, died Monday night after a brief final fight with liver cancer. He was 67. The family issued a release confirming the boxer's death. Frazier, who took on Ali in three momentous fights in the 1970s -- including the epic "Thrilla in Manilla" -- had been under home hospice care after being diagnosed just weeks ago with the cancer that took his life, a family friend said. Until then, Frazier had been doing regular autograph appearances, including one in Las Vegas in September. Smokin' Joe was a small yet ferocious fighter who smothered his opponents with punches, including a devastating left hook he used to end many of his fights early. It was the left hook that dropped Ali in the 15th round at Madison Square Garden in 1971 to seal a win in the so-called "Fight of the Century." Though he beat Ali in that fight, Frazier lost the final two and for many years was bitter about the role Ali forced him to play as his foil. Frazier was diagnosed last month with the disease, his personal and business manager said. Leslie Wolff, who has been Frazier's manager for seven years, said the boxer had been in out and out of the hospital since early October and receiving hospice treatment the last week. Frazier was the first man to beat Ali, knocking him down and taking a decision in the so-called Fight of the Century in 1971. He would go on to lose two more fights to Ali, including the epic "Thrilla in Manila" bout. Frazier was bitter for many years about the way Ali treated him then. More recently, he said he had forgiven Ali for repeatedly taunting him. While the "Fight of the Century" is celebrated in boxing lore, Ali and Frazier put on an even better show in their third fight, held in a sweltering arena in Manila as part of Ali's world tour of fights in 1975. Nearly blinded by Ali's punches, Frazier still wanted to go out for the 15th round of the fight but was held back by trainer Eddie Futch in a bout Ali would later say was the closest thing to death he could imagine. There was a time when Muhammad Ali taunted Joe Frazier relentlessly, called him ugly and challenged his manhood. After his old rival died Monday night, Ali had nothing but kind words for Smokin' Joe. "The world has lost a great champion. I will always remember Joe with respect and admiration," Ali said in a short statement. "My sympathy goes out to his family and loved ones." Frazier died at 67 after a brief battle with liver cancer. 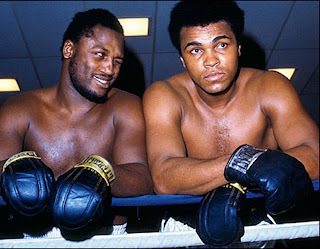 He and Ali will be linked forever, both heavyweight champions and bitter enemies in the boxing ring who squared off in three epic fights from 1971-75. Frazier won the first one at Madison Square Garden in the Fight of the Century. Ali took the last two, cementing his legend as The Greatest. Outside the ring, Ali called Frazier a gorilla and mocked him as an Uncle Tom. Between the ropes, they nearly fought to the death in the Thrilla in Manila. Those became the most poignant and defining moments of Frazier's fantastic career. But he also was the only American fighter to win a gold medal in the 1964 Olympics in Tokyo. He was the heavyweight champ from February 1970 to January 1973, an era when that crown truly meant something. He was beloved as an adopted son of Philadelphia, embodying the city's blue-collar grit. And when the last round of his final fight ended Monday night, reaction to Frazier's death poured in from every corner of the sports world. "Good night Joe Frazier. I love you dear friend," former heavyweight champion George Foreman, who stopped Frazier to win the title, posted to his Twitter account. WBO welterweight champion Manny Pacquiao said boxing lost "a great champion" and "a great ambassador." And it wasn't only other boxers who were touched by Frazier. Tennis star Serena Williams called him an icon and a pioneer. "Inspiring and loved. Your presence will be missed," she tweeted. Don King, who promoted the steamy fight in the Philippines that became known as the Thrilla in Manila, was described by a spokesman as too upset to talk about Frazier's death. WBC light heavyweight champion Bernard Hopkins, a fellow Philadelphia fighter, said Frazier was so big in the city that he should have his own statue, like the fictional Rocky character. "There's no way in the world you should come to Philadelphia and not recognize who Joe Frazier is. It's the perfect time to build the biggest statue in appreciation for all the heart and love he gave to Philadelphia," Hopkins said. "It's just to say how we regret when it's not there to touch and see. We didn't realize we had a super special person amongst us that we all in a way took for granted. I said this when he was living, I say this now. That's the only thing." Bob Arum, who once promoted Ali, said the famous bout in the Philippines was "the greatest fight in the history of boxing." "Joe Frazier should be remembered as one of the greatest fighters of all time and a real man. He's a guy that stood up for himself. He didn't compromise and always gave 100 percent in the ring. There was never a fight in the ring where Joe didn't give 100 percent," Arum said. Vitali and Wladimir Klitschko, who hold all the major heavyweight belts, paid respect to Frazier on Tuesday. "My brother and I are very sad about the death of Joe Frazier," said Vitali Klitschko, the elder of the two brothers and the WBC champion. "He was one of the really great heavyweights. He was a great champion and Joe did a lot for the sport of boxing through his social engagements." Wladimir Klitschko is the WBA, IBF and WBO heavyweight champion. Former German heavyweight Axel Schulz also praised Frazier. "He marked the gigantic era of heavyweight in the 1970s. The news made me incredibly sad," Schulz told the German news agency dapd. "I was shocked by how fast it all went." Muhammad Ali is heading to Philadelphia for the funeral of Joe Frazier. A spokesperson, handling funeral details for the Frazier family, tells NBC10 that Ali will arrive in Philadelphia on Sunday, and will attend Monday's services. Frazier was the first man to beat Muhammad Ali, knocking him down and taking a decision in the so-called Fight of the Century in 1971. He would go on to lose two more fights to Ali. Smokin' Joe's body will be lying in state at the Wells Fargo Center Friday from 10 a.m. to 5 p.m. and Saturday from 10 a.m. to 1 p.m.
"This will be an opportunity for his many fans, supporters and boxing lovers from around the world to pay their final respects to Joe Frazier," his family said in a release. Frazier's funeral will be a closed casket ceremony Monday at the Enon Tabernacle Baptist Church on Cheltenham Avenue. Guests can pay tribute to Frazier from 9 to 11 a.m. and the service will begin at 11, family said. Checks payable to ACS, Inc. Listen Now! W.E. A.L.L. B.E. Radio: Murder Rap...Who Shot Ya??? 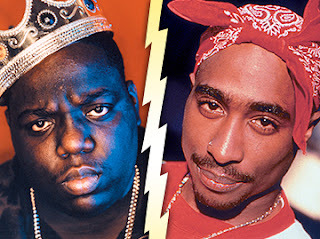 The Truth Behind The 2Pac & Biggie Murders. Listen Now!!! Spread the News!!! "Murder Rap: Who Shot Ya??? The Truth Behind The 2Pac & Biggie Murders..."
W.E. A.L.L. B.E. Radio interviews first time author and former LAPD Homicide Det. Greg Kading (http://www.murderrap.com) and awarding investigative journalist and author Cathy Scott (http://www.cathyscott.com) about new revelations and information related to the murders of Hip Hop Icons 2Pac Shakur & Christopher 'Notorious B.I.G.' Wallace. Must Listen Radio! 2PAC BACK! The Ultimate Tribute Show. 7/13/2008~W.E. A.L.L. B.E. 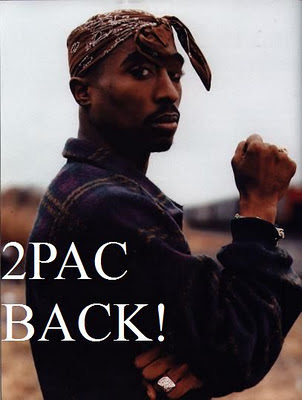 News & Radio Special:"WHY I DEFACED THE STATUE OF TUPAC SHAKUR!!! Deconstructing The Hip Hop Generation..."
Rest In Soul Power Heavy D.! LOS ANGELES (AP) -- It was as if Heavy D knew that it would be his last tweet. The self-proclaimed "overweight lover" of hip hop, who became one of rap's top hit makers with his charming combination of humor and positivity, enthusiastically told his Twitter followers Tuesday morning to "BE INSPIRED!" He later collapsed outside his Beverly Hills home following a shopping trip, unable to breathe, before he was transported to a nearby hospital where he died. He was 44. Detectives found no signs of foul play and believe his death was medically related, said police Lt. Mark Rosen. "BE INSPIRED!" was typical of the positive tweets Heavy D would send, and as his final tweet, it was fitting for the life that Heavy D lived. The Jamaica-born rapper, who grew up in New York, became one of the genre's most integral stars in the late 1980s and early 1990s, as it relied on new voices and star power to fuel its phenomenal growth in the mainstream. Heavy D and his crew -- Heavy D and the Boyz -- unabashedly burst onto the rap scene in 1987 with their debut album "Living Large." The deep-voiced rapper's earliest hit, "The Overweight Lover's in the House," played up his hefty frame. But while that nickname would stick, his weight did not become his shtick like the Fat Boys. What drew people to his music was his singular style celebrating an easygoing, party vibe -- sometimes humorous, sometimes inspiring and usually positive. Combined with the fusion of the "New Jack Swing" musical style, Heavy D was a constant presence on the charts, and a go-to figure for several performers. He collaborated with Michael Jackson on the 1991 single "Jam," rapped with a young Notorious B.I.G. in 1993 on "A Buncha N-----" and dueted with B.B. King on the 1997 tune "Keep It Coming." Heavy D, who was never afraid to bust a move or perform as a character, also found success on the screen. 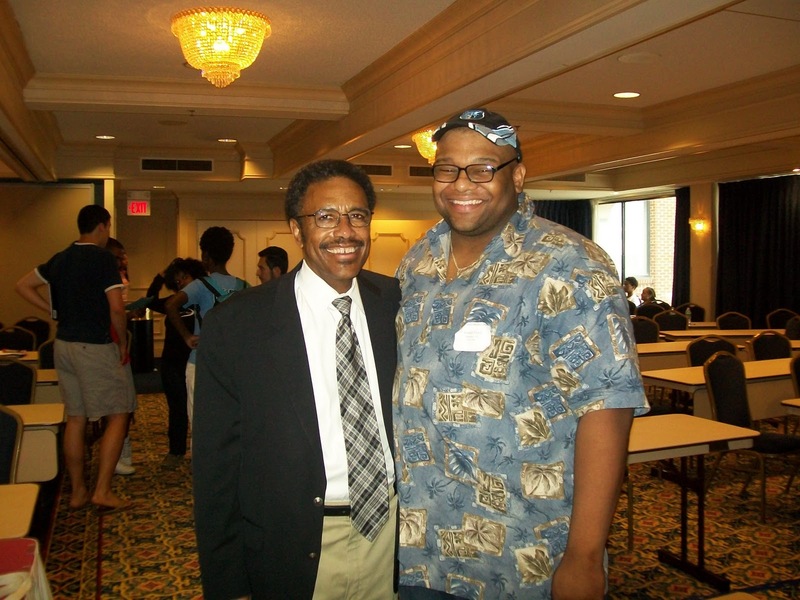 He created the theme songs for the sketch comedy shows "In Living Color" and "MADtv" and acted on such TV shows as "Boston Public," ''The Tracy Morgan Show" and "Law & Order: SVU," as well as in the films "Life," ''Step Up" and most recently "Tower Heist." 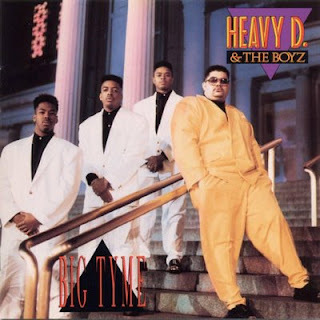 While switching between acting and performing in the late 1990s, Heavy D wasn't as musically successful with his later Boyz-free albums. He attempted a reggae-fueled comeback in 2008 with the album "Vibes," which didn't contain any rapping, before he returned to his lyrical roots on his most recent effort, "Love Opus," which was released in September. A lighter Heavy D -- coming in at apparently 135 pounds less than his former weight -- returned to the stage for a pair of energetic performances last month. He delivered a medley of past hits at the 2011 BET Hip Hop Awards in Atlanta, and joined La Toya Jackson on stage for a rendition of "Jam" at the tribute concert for Michael Jackson in Cardiff, Wales. The impact of Heavy D's inspiration was omnipresent Tuesday among the hip-hop community on Twitter. His sudden death prompted "Law & Order" actor and rapper Ice T to remind everyone to "stop for a second, take a breath and realize how lucky you are to be alive," while reminding MC Hammer that Heavy D was always "part of what's good about the world." AP Music Writer Nekesa Mumbi Moody in Los Angeles and AP Writer Mesfin Fekadu in New York contributed to this report. Video Promo: Please Join Us Friday Nov. 4, 2011, From 6PM-9PM C For Great Art & Dean McLeod!